Disney celebrated its 1 millionth Mobile Order via the My Disney Experience App today. Mobile Order allows guests to skip the line at many quick service dining locations by placing their order via the My Disney Experience app in advance and pick up their order when they arrive at the dining location. Mobile Order launched back on May 15, 2017 in Pandora – The World of Avatar. Chef Mickey Mouse was on hand at Magic Kingdom Park to commemorate the occasion with the Walt Disney World Resort Ambassadors, as well as cast members who have helped guests order, pick up and enjoy many of these million mobile orders. 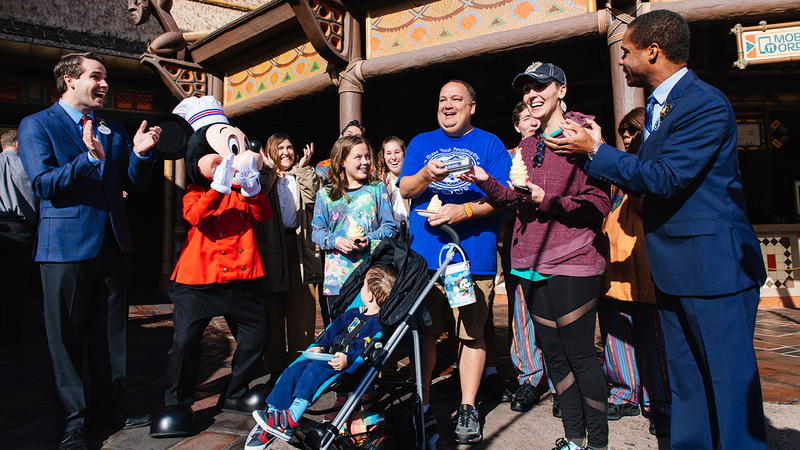 Together, they surprised and honored the Ramos family from Winston-Salem, North Carolina as they picked up their mobile order of Dole® Whip items at Aloha Isle. Take a look below to see their reaction!